Pool inspection performed at a Clairemont Mesa house. We were asked to perform a pool inspection for a potential home buyer. The San Diego home in the Clairemont Mesa, 92111 neighborhood included an aging swimming pool the buyers had questions about. The pool had a safety net which is very good for avoiding child accidents. 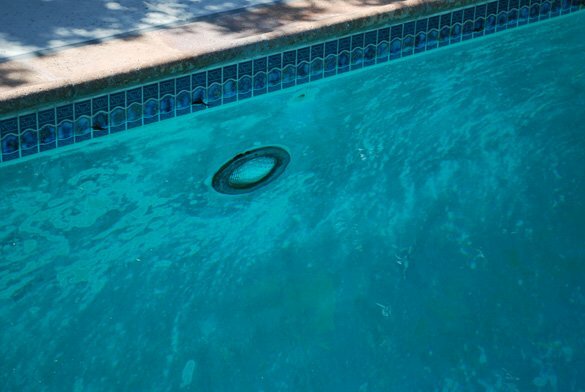 The diving board at the deep end was a safety concern so we recommended for it be removed if the home were purchased. While inspecting the pool surfaces a rust spot on the floor was noticed. 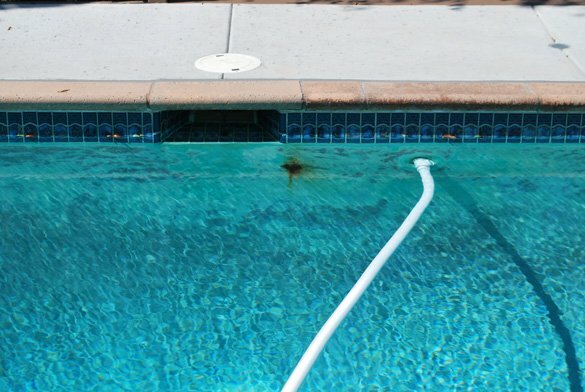 The pool rust spot was most likely caused by a crack in the plaster that was eroding the rebar. Also noticed was cracked tile which along with the rust spot needs to be repaired. 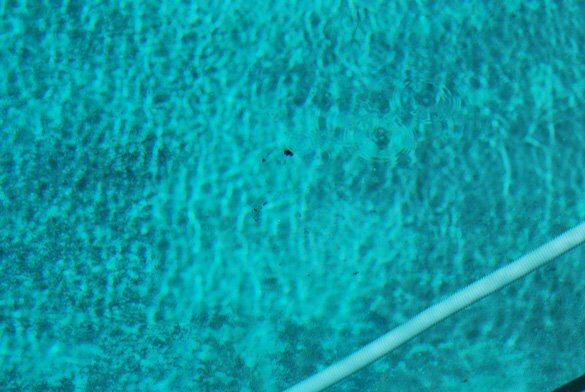 The surface of the pool had staining and yellow algae which needed to be addressed. The next step of our pool inspection was to look at the pool equipment. Although the Pentair whisperflo WFE-3 pool pump had a new motor, it was not in accordance to the Title 20 guidelines. 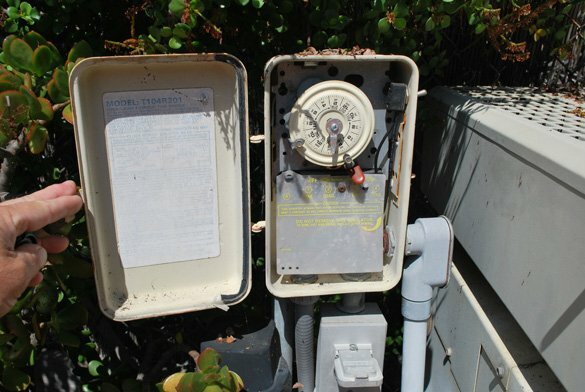 The pump volute housing was not in good condition and my need to be repaired or replaced in the future. 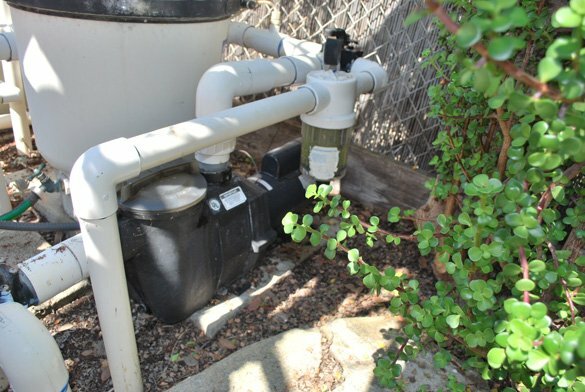 A new Pentair FNS Plus 60 diatomaceous earth filter had recently been installed and was in very good condition. 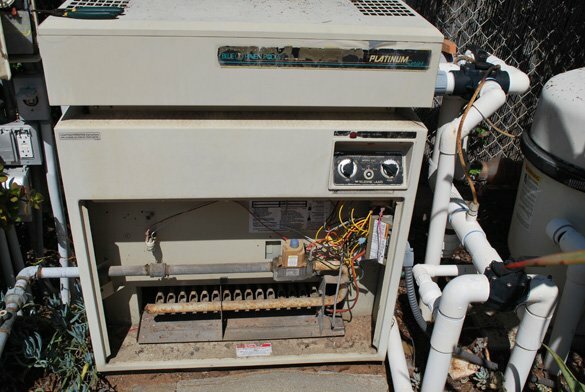 The equipment set included a CompuPool salt water system which was not working. After checking the water chemistry we found the salt levels were too low for the salt chlorine generator to work properly. We recommended for the salt cell to be cleaned, salt to be added to the pool, algae to be removed and balancing the water chemistry.